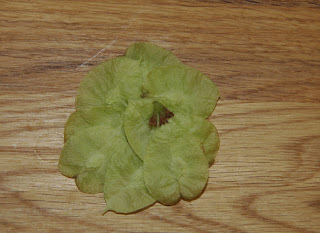 Those elm samaras were a tasty find. I'm glad you spotted them! Emmett used to eat the young leaves of elm seedlings and suckering shoots - it was his favorite green at the park. I thought of it as his salad course, because he started every park adventure that way, and in late fall he'd search intently for the last few bites. I'm sure he would have loved the samaras - much shorter season, though, and kind of high in the air for dog harvesting. I hope your Fafard day was fun and successful. I was surprised how many people were in a gardening mood yesterday, despite the gray and chill - the nursery was jammed.